There is perhaps no sadder example of colonialism’s human toll than the life of Ota Benga. Grand narratives of nation and identity are often inscribed in little-told stories of individual degradation, of people whose bodies were slates on which we wrote theories of racial superiority and nationalistic triumph. Benga, a Congolese pygmy, lived a nightmare. He was first brought to America by Samuel Phillips Verner, a former Presbyterian minister from South Carolina, who had—like so many white men at the turn of the century—left his calling to pursue fame and fortune in Africa. He did so by acquiring natives for display at human zoos. How Verner met Benga is unclear—Verner’s story constantly changed—but we do know that he brought Benga into the country as part of a “native” exhibition at the 1904 Saint Louis World’s fair. After his appearance at the St. Louis fair, Benga was supposed to be returned to his home country, and he did travel with Verner back to the Belgian-controlled Congo. Weight, 103 pounds. Brought from the Kasai River, Congo Free State, South Cen-tral Africa, by Dr. Samuel P. Verner. Exhibited each afternoon during September. Like all of the residents of the Bronx Zoo, Benga was forced into the eyesight of curious crowds who gaped at the young man who had been dressed in animal skins. The zoo’s director, William Temple Hornaday was eager to reassure the crowds of their racial superiority and told detractors (of which there were many) that Benga’s display was for purely scientific reasons: after all Benga, a black African wasn’t too different from his monkey companion—hardly human, he was just another step on the evolutionary ladder. Benga remained at the Bronx Zoo for over two weeks—Hornaday was unable to manage the growing outcry and, unsurprisingly, Benga proved unwilling to entertain. Eventually Benga was released to a group of African Americans in Brooklyn, and later moved to an outpost of their community in Lynchburg, Virginia. But Benga’s story did not end happily. He shot and killed himself on March 20, 1916, estimated to be 32 years old. I spoke with Newkirk via email. 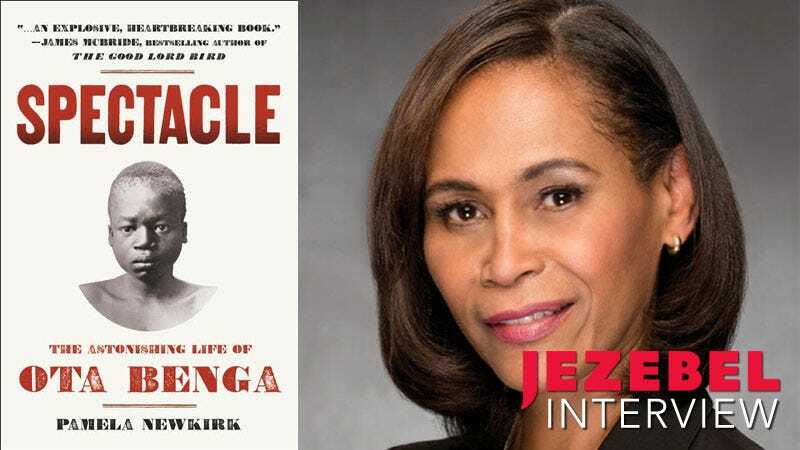 Jezebel: Can you speak a bit about how you arrived at Ota Benga’s story? Pamela Newkirk: I wanted to look at race in New York City at the turn of the twentieth century and thought the exhibition of Ota Benga in the Bronx Monkey House was incongruous with my perception of the city of my birth. I wanted to know how it came to be. I also had trouble reconciling his exhibition with the widely reported claim that he was the friend of Samuel Verner, the man who brought him to the United States. Benga didn’t leave any letters or diaries, there is nothing written in his own hand. I would imagine that it’s quite difficult to render him complete when history has effectively silenced him. Did you find that to be true? What kind of difficulties did you face constructing his biography? Without having his own written account, I had to piece together the story through the letters and autobiographical accounts of his associates, along with newspaper accounts, census date, ship passenger records, anthropological field notes and the like from the period. By looking at these records I was able to trace Ota Benga’s footsteps from the Congo, and through Europe and the United States. The people most responsible for his exploitation privately wrote about him in unguarded ways. For a century, they had the final word on what had actually transpired. At one point Verner writes about Benga: “He is absolutely free.” In the book, you point out the dissonance in this statement. Can you speak to the murky place between “free” and “black” or “African” in America at this time. How does the term “free” function in Benga’s life? It is precisely this dissonance between what is said and what is done that drives the narrative. Verner says he is Benga’s friend yet he defends his degradation—his exhibition in a monkey house cage with an orangutan. He says he’s his friend yet depicts him as a cannibal and a savage on the St, Louis World’s Fairgrounds where Ota Benga and his countrymen are heckled, assaulted and forced to live in frigid and inhospitable conditions. We soon see that Verner’s idea of friendship with a person he considers inherently inferior does not conform to our generally accepted ideas of friendship. We also see that Verner is not a reliable narrator of events as his accounts of how he acquired Benga radically conflict over time. In your preface, you write that “the saga of one man’s degradation….is also the story of an era… of racial ideologies that endure today.” Can you elaborate on just how you think Benga’s history still haunts us? The racial ideology that resulted in Benga’s capture and captivity in the zoo was deeply embedded in science, in politics, media and in American popular culture. President Obama rightly said it is part of the nation’s DNA. It has proven difficult to dislodge this ideology of black male savagery and inferiority which helps explain a loop of lapses—from the killing by police of unarmed black boys and men to the mass incarceration of young black males, largely for drug offenses for which white males are equally guilty, but not generally punished. Benga spent a harrowing twenty days in captivity at the Bronx Zoo. What do you think the breaking point was for Benga? Do you see a substantial difference between his time St. Louis World’s Fair and the Bronx Zoo? The breaking point was both his own apparent resistance to captivity, along with the mounting protests by individuals who courageously defied the racial conventions of the time to highlight his humanity. There did not seem to be the same kind of protest to his exhibition at the World’s Fair where he, like many others, were part of a human exhibition. In the Bronx, he was exhibited with apes. You bring up how shame likely affected trauma, suggesting that he perhaps suffered from post-traumatic stress which ultimately played a role in Benga’s suicide. Can you elaborate? There are no medical records and we cannot precisely know why Ota Benga ultimately took his own life but as someone who was taken, likely by force, from his homeland, separated from his loved ones. and then treated inhumanely in St. Louis and then the Bronx, it is not difficult to imagine the psychological impact of his circumstances. Add to this the ongoing atrocities in the Congo under [the Belgian king] Leopold’s reign and the prospect of never returning to his loved ones. His associates also described his shy nature and reluctance to be in a crowd. Lastly, you write about the Bronx Zoo’s pretty recent inability to come to terms with its history - why do you think that is? Why is Benga, in particular, buried by history? More than a century later, there are no historical markers of Benga’s exhibition at the Bronx Zoo where he was seen by tens of thousands of people, nor has the zoo published an accurate account of what transpired. One zoological society account suggests that Benga was actually a zoo employee or helper while no plausible reading of the historical documents support that. I believe that shame has resulted in revisionism—a sanitized version of history.